The Dutch coach of Manchester United, Louis van Gaal was clearly frustrated about the defeat that his team suffered against West Bromwich Albion and after the match reached it’s end, it didn’t take long for Louis van Gaal to voice his thoughts about what happened in the game and he believes that the crucial moment of the entire game was Juan Mata’s dismissal after having received his 2nd yellow card in the first half. Juan Mata’s dismissal forced Manchester United on having to play with 10 players in the pitch and they just couldn’t hold their ground for the entirety of the match as Salomon Rondon capitalized on the numeric advantage that his team had as he scored the only goal of the entire match at the 66th minute. Salomon Rondon was left completely unmarked and this allowed the Venezuelan player to take control of the ball and slot it past the likes of David de Gea, this occurred when a cross was launched in the path of Rondon who made no mistake in firing it home in the 2nd half. ‘’The first was a stupid yellow card. You know it is a yellow card in advance. When you have a yellow card you have to take care of that. The referee can always give another yellow card then and then it is a red card. The second you know you already have one so you have to take that into account. You damage the team." Louis van Gaal told the media following the defeat of his team. He also likened the chase for the Champions League to a horse race and admitted that if United was one of the Gold Cup competitors, they would probably be 'Road to Riches' - a horse with a good chance but high odds on StanJames. 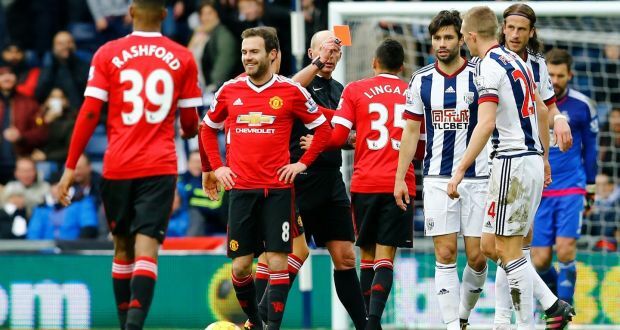 Louis van Gaal continued on saying that Juan Mata rightfully deserved the yellow cards but that the referee should also take into consideration the players who he gives the cards to as Mata is a player who never before in his career, had received a red card and is someone that doesn’t want to hurt anyone. Despite all of Louis van Gaal's protestations, it won’t make any difference as there is nothing that the Dutch coach do to change what has already happened but nonetheless, United still have a chance of snatching up a Champions League spot but can’t afford any further disappointing results.